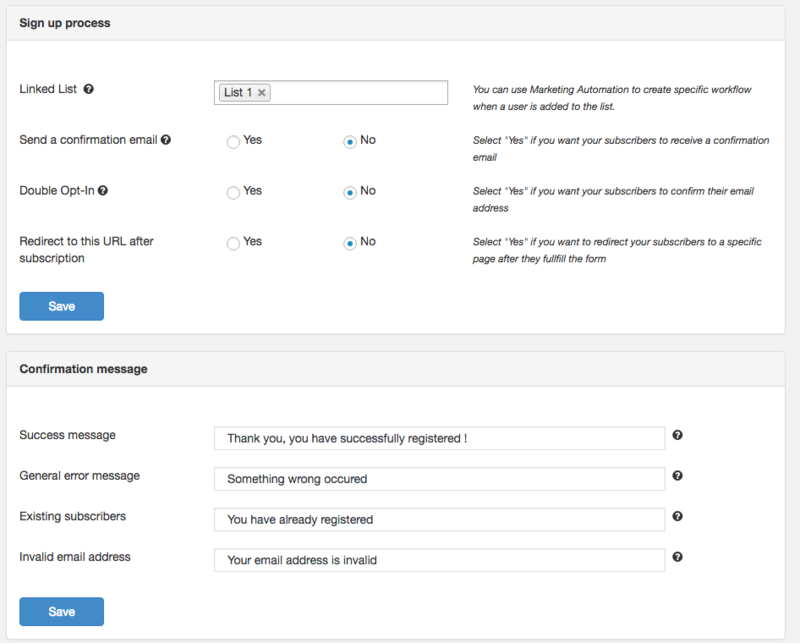 Start sending your newsletter directly from Wordpress! 4. Follow the instructions: simply enter your SendinBlue API keys. This is, of course, the plugin's main function. Most importantly, you will be able to specify the fields that make up your forms. 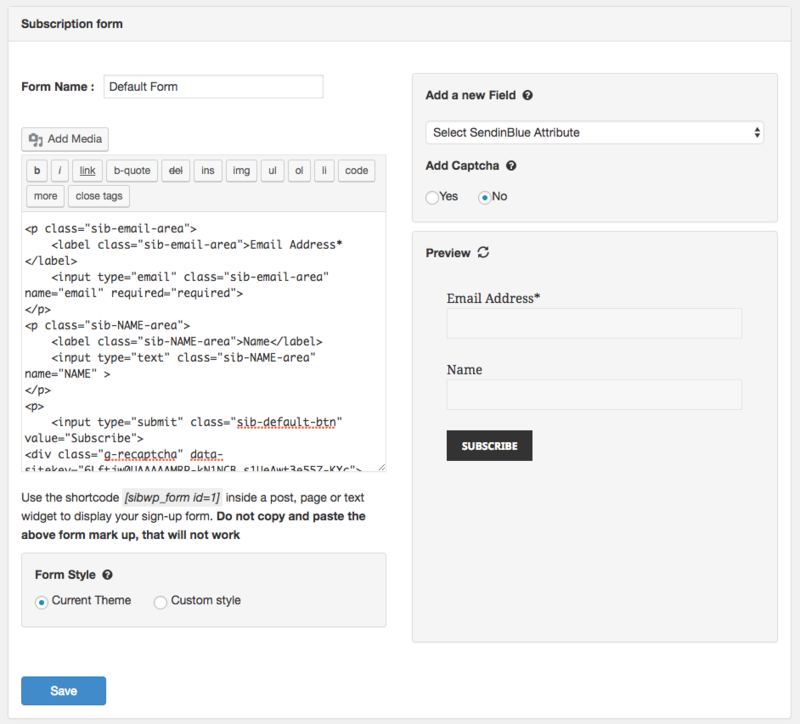 – On the right, a simplified interface for adding a field to a form, as well as a view of this. You can also add a Captcha to a created form. To do this, select "Yes" and enter your "site key" and the relevant "secret key" (more information on this here), then, as you would for other attributes, click on "Add to form". Note: don't forget to refresh the preview to see your changes. Once you have configured the form, you just need to go to the Appearance/Widgets menu to add the "SendinBlue form" widget to one or more sidebars. 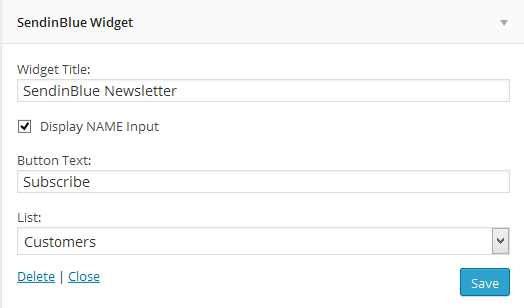 Note that the widget has a number of settings, including the list to which subscribers are added and the appearance (or not) of certain fields. This allows you to have specific forms for different parts of the website. For example, for a themed portal you could have a themed form with specific questions and a separate list for these subscribers, which would enable you to better manage future mailings. 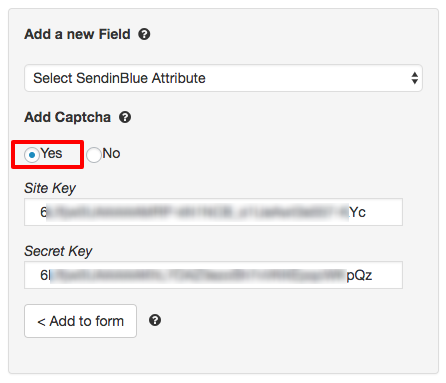 If you activate the option "Transactional Emails", all WordPress emails will be sent using the SendinBlue SMTP server. In real terms, this gives your emails the best possible chance of reaching their intended recipients and provides you with real statistics. On the plugin's Statistics tab (or from your SendinBlue account), you can see whether each sent email has been safely received, opened and clicked. 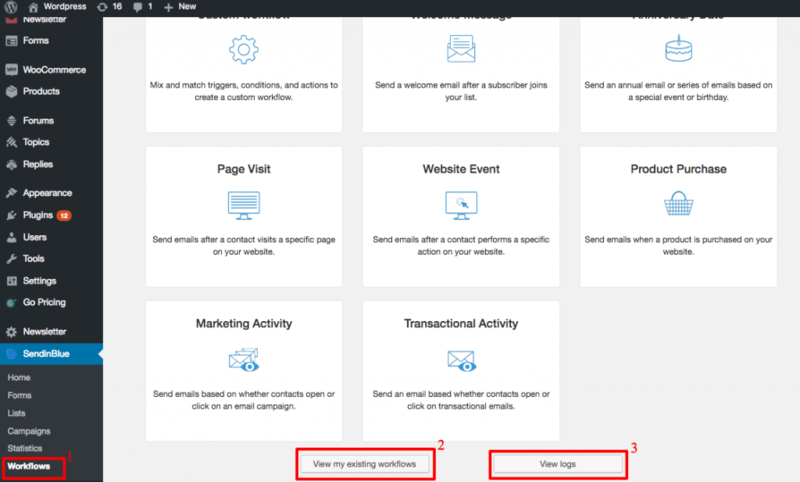 The SendinBlue plugin also enables you to enable Marketing Automation on your website and track your contacts' activity on your website in just one click. This is very easy to do: on the plugin's home page, check the "Enable Marketing Automation using SendinBlue" and click on "Confirm". 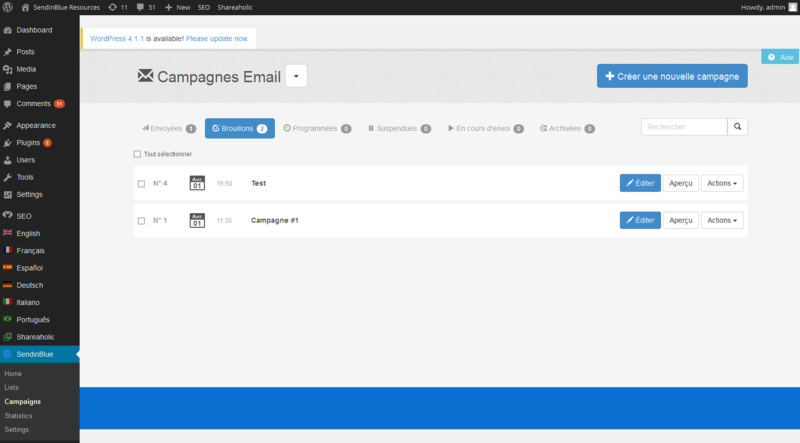 Then SendinBlue will automatically install the script to track your contacts' activity on your website. That's all you have to do for this installation. Once this feature has been enabled, you'll see a new "Workflow" menu in the left-hand menu (1). When you click on one of the preset workflows, you'll be redirected to SendinBlue to define all of the workflow's steps. 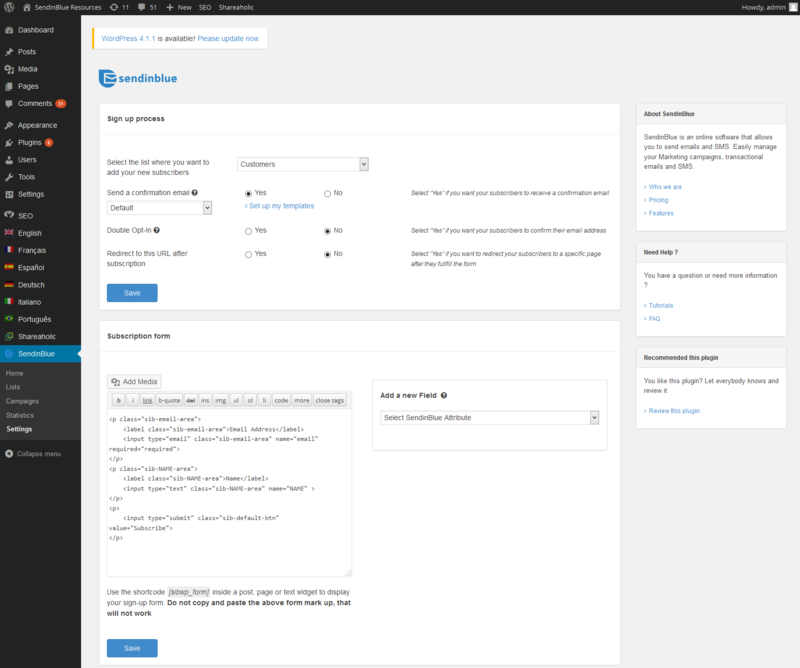 You can also view the Marketing Automation logs (3) or your current workflows (2) from this page. 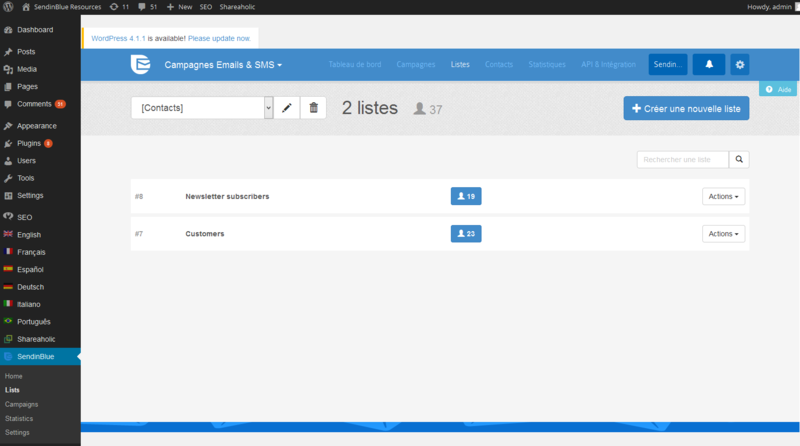 – Manage lists: new lists, contact searches, segmentation, etc. – Manage campaigns: current campaign reports, new campaigns, etc. Below we have provided you with some useful screen shots. If you need any help, please send an email to support@sendinblue.com.